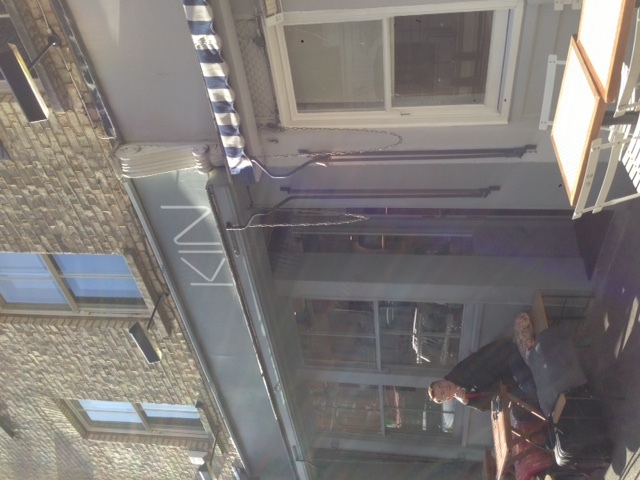 I had been waiting for an opportunity to try Kin Cafe in Fitzrovia for a while. Having followed them on Twitter, I had been tempted by the large selection of great-looking vegetarian and vegan food choices tweeted almost daily. Although I’m no longer a vegetarian, appetising meat-free meals are always appealing. So it had been on my “to try” list for a long time (preferably for lunch). However, sometimes things don’t work out quite the way you had initially hoped and so it was late afternoon by the time we ended up at Kin, sadly no lunch then. So we settled on an Americano, soya hot chocolate and a slice of Butternut and ginger cake. The coffee (from Clifton Coffee) was very fruity and full of character, highly enjoyable while sitting in the window overlooking the street outside. The cake meanwhile deserves a special mention. Not only was the cake very good, the helpful staff at Kin were very confident in their knowledge that this cake was nut-free and they also ensured that the new member of staff (being trained) used a new cake slice to serve it. Extra ‘points’ for a nut-allergy aware café and definitely a tick in the “cafes with good nut knowledge box”. As we sat with our drinks, one of Beethoven’s quartets was playing through the loudspeakers. For me, Beethoven being played in the background is a bonus for any café but it did, perhaps, mean that I was less sociable than normal with my frequent companion in these reviews; the quartets are too absorbing. I do hope the hot chocolate made up for it. 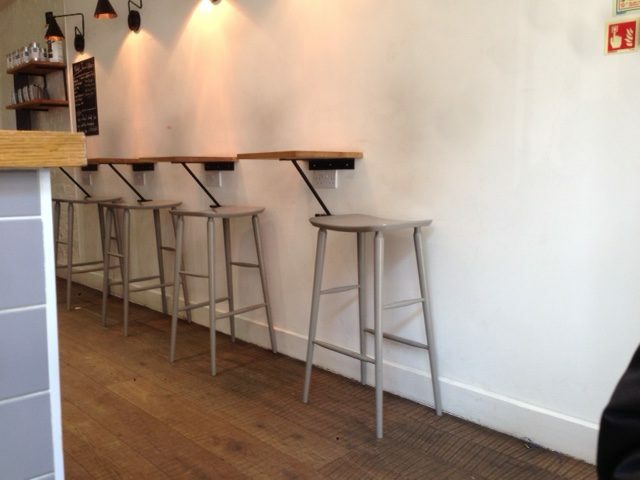 Tables are supported by struts forming triangles. But this is not the Pythagorean link. Inside the café, tables along the wall were each stabilised by a diagonal support. A practical arrangement that had the visual effect of forming a triangle with the wall. While this did make me think about force-balancing and Pythagoras, this is not the link to Pythagoras alluded to in the title. No, instead the connection goes back to the Beethoven and the links between music and mathematics. Perhaps we no longer immediately think of music and mathematics as being particularly connected, after all one is an ‘art’ and the other a ‘science’. But music and mathematics have, traditionally, been so inextricably linked that, as Susan Wollenberg wrote in ‘Music and Mathematics’* “… it is their separation that elicits surprise”. Some of the links between music and mathematics are explored in this TED-Ed talk about the maths to be found in Beethoven’s Moonlight Sonata. This part of the link between music and mathematics comes in the relation between what is known as consonant and dissonant notes. The first part of the Moonlight Sonata is made up of triplets of notes that sound good to our ears when they are played together. As Pythagoras is said to have discovered (see link here, opens as pdf), there is an interestingly simple relation between notes that are consonant with each other. Whether you look at the frequency of the notes or the length of a string required to play them, the ratio of two consonant notes seems to be a simple number ratio. For example, the A of an oboe has a frequency of 440 Hz*. The A one octave higher is at 880 Hz, a factor of 2. If we took instead a series of notes of frequency f, then we could find a series of consonant notes at f:2f:3f. But now, remembering that octaves are separated by a factor of 2 and that they ‘sound good’ together, this will mean that the ratio of frequencies f:1.5f:2f will also sound good. This set of frequencies just happens to coincide with the C-G-C’ chord that forms the basis of many guitar based pieces of music. As you continue looking at these simple number ratios you can start to build a set of notes that eventually forms a scale. 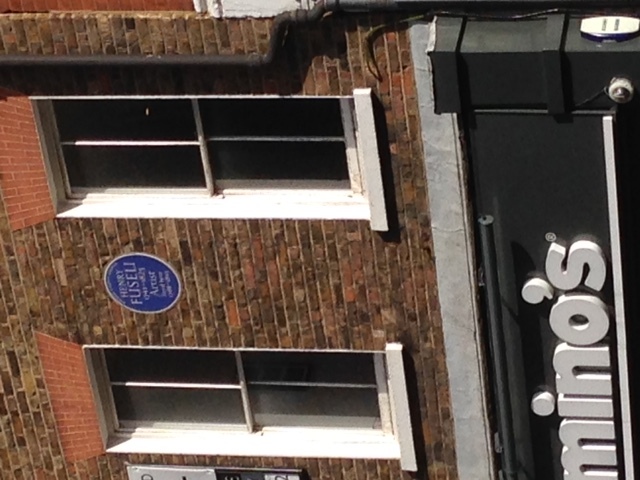 The artist Fuseli once lived diagonally opposite Kin Cafe. J. James notes that Fuseli was part of the artistic revolution that was paralleled by Beethoven and the Romantics in the musical sphere**. One to consider next time you happen to wander into Kin Cafe, or another café playing such mathematical composers as Beethoven. Lastly, a video of Wilhelm Kempff playing Beethoven’s Moonlight Sonata. I would really recommend playing it twice, the first time to listen only, the second to watch while Kempff plays. His performance is fascinating.